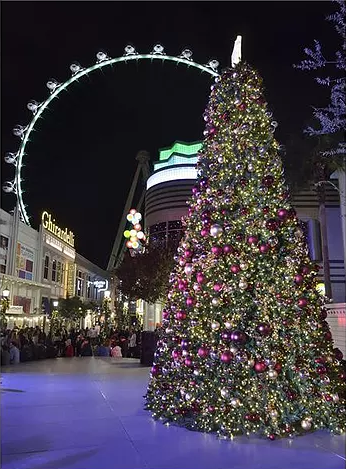 LAS VEGAS, Nov. 28, 2016 - Las Vegas is embracing winter and the spirit of the holidays this season. The destination will be decking halls, spreading holiday cheer and transforming into a winter wonderland for visitors looking to celebrate. As the ultimate destination to spend the holiday season, there is a plethora of holiday lights, outdoor festivities, activities and more for celebrators this year. Overlooking the heart of Las Vegas Boulevard, The Ice Rink at The Cosmopolitan of Las Vegas welcomes visitors to skate on over 4,200 square feet of real ice. Visitors are encouraged to warm up or roast s'mores by the fire, delight in light snow showers, enjoy seasonal treats and beverages with breathtaking views. On Mondays, skaters can catch two classic holiday movies on the resort's digital marquee. It will be a December to Remember at Neon Museum, where a vast collection of restored neon signs resides. The Museum will host a holiday celebration with ornament-making, photo opps with Santa, hot chocolate and caroling by the Las Vegas Academy choir in the colorfully illuminated Neon Museum Boneyard. Part of the City of Las Vegas Cultural Corridor's holiday festivities, December to Remember will take place Saturday, Dec. 17. Glittering Lights at the Las Vegas Motor Speedway is Las Vegas' largest holiday drive-thru light show. Featuring more than 3 million lights throughout a 2.5 mile course that intertwines with the speedway, Glittering Lights has been a beloved holiday tradition for 16 years. Glittering Lights is open nightly through Jan. 7. Throughout November and December, two holiday shows will be playing at The Smith Center for fans of the performing arts. Irving Berlin's White Christmas will be performed during November, while the Nevada Ballet Theater will be performing The Nutcracker weekends during December. The Magical Forest at Opportunity Village is one of Las Vegas' most cherished, and now the longest running, holiday tradition. For 25 years, Magical Forest has decorated pine trees spread throughout their mini forest, centered around a large holiday tree. In addition to the lights, Magical Forest offers activities, rides, treats and other events to celebrate the season. The Las Vegas Convention and Visitors Authority (LVCVA) is charged with marketing Southern Nevada as a tourism and convention destination worldwide, and also with operating the Las Vegas Convention Center and Cashman Center. With more than 150,000 hotel rooms in Las Vegas alone and almost 11 million square feet of meeting and exhibit space citywide, the LVCVA's mission centers on attracting ever increasing numbers of leisure and business visitors to the area. For more information, go to www.lvcva.com or www.LasVegas.com.